Life is crazy. If you’re on this blog it’s probably because you’re a planner and might be juggling quite a few things in your life, usually for other people. It’s so easy to keep running on that treadmill – check the box, yay! Check the box, yay! And before you know your day has become all about checking all the boxes! In the midst of all that, we may be getting tasks accomplished but it’s exceedingly difficult to stay refreshed, fulfilled, balanced, well. What gives me energy? Find more time and ways to do more of that. What drains my energy? Find ways to decrease, delegate, eliminate these things. How can I structure my time around these things, and create space for the things that matter to me? One way is having a weekly planning meeting – but this can be automation, batching tasks, having a cap of evening commitments, and more. But then how does that play out, practically, realistically? There are 5 ways I incorporate self-care in my bullet journal. One of the foundations of well-being is my mindset, and taking stock of the things that are going well. What we see is what we manifest, and it is really easy to focus on the things that go wrong. We should NOT ignore bad things – it’s also very important for mental health to acknowledge these negative things and move through them. I am not a fan of glossing over the bad. But we can do both acknowledge hardship and push ourselves to find some bright spots to remind ourselves it’s not all bad. Inspired by Kim, I wanted to take stock of the small but brilliant things I’m grateful for each day. So I’ve tried the gratitude log in several ways, as a collection and incorporated into my Weekly Layout. The collection is neat because you see all your gratitudes grouped together in one place which you can revisit later. 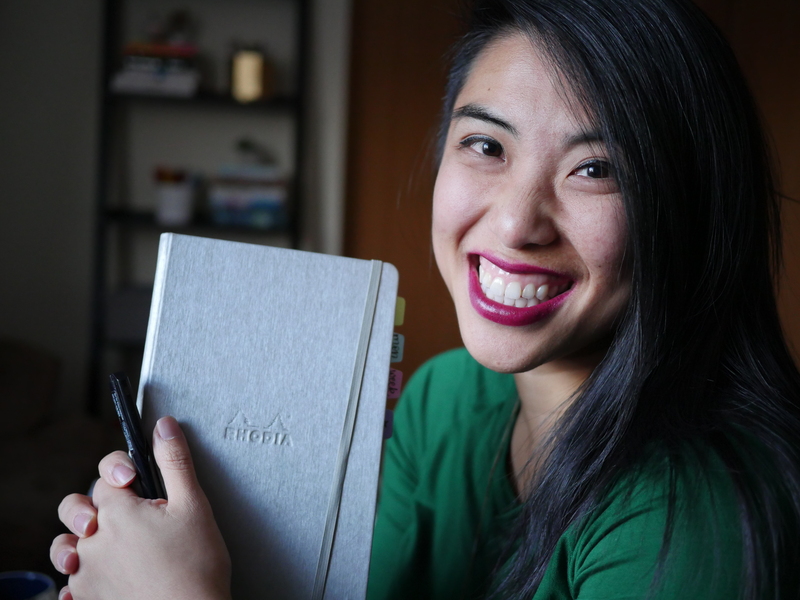 If you bullet journal in a traveler’s notebook, you might even have a notebook dedicated to journaling and gratitude. I had to try REALLY hard to keep up with this and eventually stopped doing it because I wouldn’t remember. So I added a row to my weekly layout to jot down some gratitude – this is working so far! Because it’s right in front of me all the time, I remember to do it in the moment, which captures more spontaneous things. What I also appreciate about this is that I can flip back through and see my gratitude in context to my day, which gives a fuller picture. Whether you use a daily, weekly, or monthly tracker, you can design what habits you focus on. I talk about it in my habit tracker video a little bit, but if it motivates you to check off the habit box, decide which habits will be critical drivers of self-care. Remember though, just focus on a FEW habits – or it’ll do the opposite of recharge you and drain or overwhelm you instead! I’ve done this a couple ways but mainly I’ve had a separate notebook insert in my Foxy Notebook. By keeping it with me, it increased the chances I might do it. Alas, it is a hard habit for me to keep up with, perhaps because I’m always reflecting and processing by nature of my job, but it is helpful nonetheless. There’s something gratifying and horrifying about being able to look back on your journals later and see what 15-year-old you was angsting about… no? Just me? EITHER WAY – it can be a cool keepsake for you and for family to look back on. It’s sometimes cool to see how far you’ve grown. Sometimes we just need a reminder of all the things we can do to give us energy and care. Whether these things take 5 minutes or 5 hours, you can have a collection that will take the effort out of coming up with an idea. These can be then incorporated into your daily or weekend plans. Sometimes, these aren’t the tasks we need to be doing. Sometimes we find out that a task is just not that important, that it’s no longer relevant, and that it was a fleeting thought. And ALWAYS – we are not what we produce or check off. You are not your to do list. To combat that trap, I’ve added a heart to my icon list – to capture moments and things that happen that make my heart full. This tells my brain that those things are worth just as much as filling out expense justifications, or grading papers. This can be the awesome conversation in passing with a colleague, or yoga breaks at work. So there’s a few suggestions – but I’ll also add one final one. Remember that you can always take a break from your bullet journal. That’s one of the unique things about it – you won’t waste any space, you don’t HAVE to use the space – just step away, refresh, and return when you can. It will always be there. How are you incorporating self-care into your bullet journal? Let me know down below! I need a recharge page. Mahalo for all of your tips. I would love to see it when you make one! Is there still a 30-day midori challenge? LOVE this!!! I always look so forward to your posts Jessica. Love how you keep it real. Blessings to you! I so appreciate your feedback on how I try to “keep it real” – I feel pressure sometimes to make things seem super positive all the time, but want to add some sass and “realness” to it all 🙂 Thanks for reading, Kim! I love the idea of keeping track of things that make your heart full, instead of just endless lists of things to do. What a great reminder of why we are all keeping our bullet journals, not just how to do it. Thanks for all the inspiration. Thank you for sharing your kind words, Jenn 🙂 That’s what keeps me going! I really liked this article because always being “busy” isn’t healthy nor really what I aspire to do. I am always striving for that balance of work and home life and down time . Thanks for the self care collections ideas and keeping things real! What a great post. Thanks for sharing. Love the recharge page idea. The thing that really fills my heart is the same thing that drains it right now. The group that I love is in a big push for the end of 4 years of work with our week-long Big Event in the end of June, but I don’t know how this year will go. Tempers are short, lists are not made, communication is pretty laughable (if it was funny) and it’s my circus… but not my monkeys… sigh… it will get better it will get better itwillgetbetteritwillgetbetter…. Oof – I can imagine that’s stressful, girl. I wonder what your options are as the ringleader of that circus? Perhaps you can just ask, point blank, what the barrier is to doing this work and how you can pull together? I am wishing you luck! I really enjoyed your post! I’m fairly new to bullet journalling (I’ve been doing it for just over a month) but primarily started using the system as I thought it was a good mental health tool. I already incorporate some of the things you talked about, but I think I’ll be adding a recharge collection soon, it seems like a good idea when you’re feeling low and can’t think of something positive to do. Yes, if I can imagine those possibilities now when I have mental capacity, hopefully it will make it easier to implement when I don’t 🙂 what are some of the things on your list? Maybe I can expand mine! That was my thinking! I have a range of things. some as simple as take a long shower or watch a youtube video, right up to more time intensive things like going home to visit family or going to the theatre. I really love these ideas and am totally going to make myself a “Recharge” list as well as a “Get It Done Already” list. I have a tendency to just slack and not do anything but still feel stressed. I got it from the shop Atelier Dreams on Etsy! This has really struck a chord with me. Only yesterday it occurred to me that my journal is prompting me to complete household tasks and catch up on admin which is great, but I seem to have forgotten to schedule time for things that I would like to do rather than things that need to be done. I have only been journaling for a month and I am definitely more organised and productive but now I am reminded to schedule my leisure needs too. Thanks Jessica. Very important. We often forget to take care of ourselves. I like having these reminders. This would be a really awesome post to add to our linky party http://slapdashmom.com/bujo-mojo-week-1/ Hope to see you there!!! If I got ANYTHING out of this it was the reminder to “read a damn book” which I have had on my list for years… lol Kidding – but this was a great post and I think I may just create a journal just so I can add some self care into it. Thank you for this! You’re welcome. I love reading – I just need to fit it in. Once I actually GET to reading I can sit and read a whole book. I have been thinking about getting audible type of thing going as well. Good luck! I love the recharge page! Definitely going to incorporate one into my bujo. Hello Jess (always love meeting other Jess’s haha)! Great post, and I must say I like your layouts so may have to steal your ideas! You made a great post here about how your to do list isn’t you and sometimes it’s easy to forget that. Thanks for the nice reminder! Oh my goodness!!! This was such a fabulous article/blog post!! Thank you soooo very much!!! I just learned about bullet journals this past May. After I finally grasped the concept I dove in and started my first bujo on May 29, 2017, Memorial Day. I am soooo in love with bujos!!! I have kept journals since I learned to write thanks to a great teacher I had in school. But they are the type where I just write thoughts and poetry and stuff like that in them in paragraph and story form. The bujo is such an amazing concept and I’ve only missed two days since starting it of writing in it. My other journals, sometimes I would go months without writing in them because I just didn’t have the energy to do it. I use my bujo to help me keep track of things and as a mental health tool. I live with Bipolar Disorder and several comorbid disorders along with some physical disorders. I honestly can’t even explain how much of a difference the bujo has made in my life. Now, with your suggestions that I am now incorporating into my own bujo, it will be an even better tool for me to use. “You are not your to do list.” Thank you for saying that. I needed to hear that. Sorry to have written you a book, I just really liked your blog and I wanted you to know how much you helped me today and to thank you for that. You have a new fan and a new subscriber!! Thank you for this. As someone who has found out the hard way I need to do self-care daily, and as someone who has a very difficult time doing so, I found this so incredibly helpful, even over a year later! Thank you!